Tumor progression is driven by mutations that confer growth advantages to different subpopulations of cancer cells. As a tumor grows, these subpopulations expand, accumulate new mutations, and are subjected to selective pressures from the environment, including anticancer interventions. This process, termed clonal evolution, can lead to the emergence of therapy-resistant tumors and poses a major challenge for cancer eradication efforts. 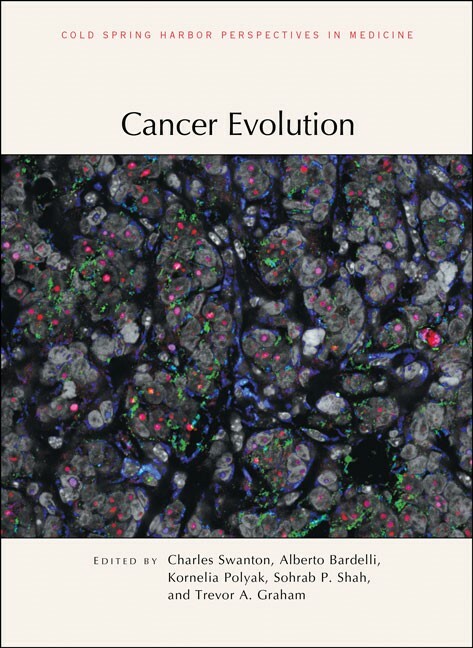 Written and edited by experts in the field, this collection from Cold Spring Harbor Perspectives in Medicine examines cancer progression as an evolutionary process and explores how this way of looking at cancer may lead to more effective strategies for managing and treating it. The contributors review efforts to characterize the subclonal architecture and dynamics of tumors, understand the roles of chromosomal instability, driver mutations, and mutation order, and determine how cancer cells respond to selective pressures imposed by anticancer agents, immune cells, and other components of the tumor microenvironment. They compare cancer evolution to organismal evolution and describe how ecological theories and mathematical models are being used to understand the complex dynamics between a tumor and its microenvironment during cancer progression. The authors also discuss improved methods to monitor tumor evolution (e.g., liquid biopsies) and the development of more effective strategies for managing and treating cancers (e.g., immunotherapies). This volume will therefore serve as a vital reference for all cancer biologists as well as anyone seeking to improve clinical outcomes for patients with cancer.